Over 100 people were killed and more than a quarter of a million displaced after tropical storm Ketsana dumped the heaviest rain on The Philippines capital city, Manila, in more than 40 years, officials said yesterday. Manila and surrounding areas were lashed with rain for nine hours on Saturday, leading to flash floods that inundated about 80 per cent of the city of 12million inhabitants. The deluge left some areas under up to 6m of water, stranding families on rooftops and forcing the government to declare a state of disaster. Highways were turned into raging rivers that swept away shanty towns and cars. Video footage from military helicopters showed marooned residents pleading for food and help. The Tropical storm, Ketsana, displaced nearly 280,000 people in Manila and five provinces, with more than 41,000 people finding refuge in 92 evacuation centres. More flooding may hit northern provinces if the reservoirs and dams overflow. Check out our live Philippines weather cams overlooking the capital city of Manila and the Philippines holiday resort island of Cebu. 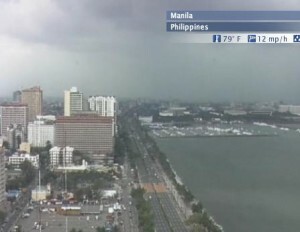 Our live weather cams in Manila and Cebu will let you see when the Ketsana Tropical storm finally departs the Philippines.